St. Joseph School is committed to provide its students an exceptional education in a nurturing and uplifting environment to unleash each child’s passions and talents. One class for every grade allows teachers the ability to assess each student and formulate a personalized experience that maximizes academic development. Grades five through eight are departmentalized based upon a middle school model. Students are instructed by specialists in language arts, social studies, and science. The subject of mathematics is taught in smaller group settings, with the classroom divided by ability. To qualify for the accelerated group, students must have an A average for the year and a teacher recommendation. Strong performance on the IOWA Assessments is also expected. The mathematics program includes critical thinking, problem solving, and the various strands in mathematics. All students are instructed in algebra in eighth grade. The literacy program focuses on the development of listening, speaking, writing, and reading skills. Students expand their knowledge of the writing process, produce literary pieces in a variety of genre including descriptive writing, persuasive writing, reports, research papers, letters, poetry, drama, and fiction, and are encouraged to publish their work in a wide variety of formats. The reading program emphasizes comprehension, analysis, and appreciation for all literary genre. The social studies program includes the study of history and geography. The following history is taught in the following grades: in fifth grade, the Americas and the Western Hemisphere the Eastern Hemisphere in sixth grade, Early America to the Reconstruction Period in Grade 7, and the Reconstruction Period through Modern America in eighth grade. To study civic issues, current events are also part of the curriculum. 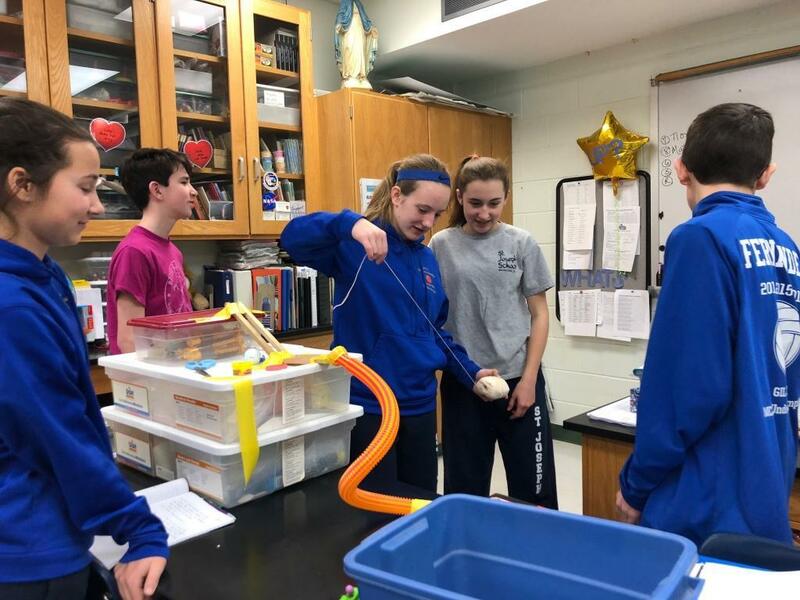 The science program in the upper grades includes the studies of Life Science, the Earth, and the Physical Sciences in an inquiry-based format. Labs are an integral part of the curriculum, and students actively engage in scientific methods to explore their world. The Spanish curriculum includes grammatical learning as well as conversational classes. Throughout the grades, students continue to develop speaking and listening skills as well as learn about the variety of cultures within the Spanish speaking world. In the upper grades, emphasis expands to reading, written practice, and vocabulary. A variety of technological applications help students develop their abilities to retrieve, analyze, and present data. Students develop competency in MS Word®, PowerPoint®, Excel®, MovieMaker® and Publisher®, and subject-area software. Students also make extensive use of the library and Internet resources to conduct research, including website evaluation. St. Joseph School follows the curriculum guidelines outlined by the Diocese of Paterson and based on the New Jersey Core Curriculum Content Standards. Technology applications are integrated throughout the curriculum. Technology instruction is provided in the Makerspace and followed through in the classrooms, all of which have Internet access and SMART Board technology. The New Jersey Core Curriculum Content Standards also form the structure for our specialists in the subjects of computer application, library skills, art, music, and physical education. Students may also elect to take instrumental music and participate in the band. The religion curriculum builds on the strands of the Church, sacraments, and the morality studies taught in the earlier grades. Students study Holy Scripture and are prepared to become the future leaders of the Church. Students also learn to relate their knowledge to current issues of social justice. Classes are taught by the classroom teacher, with some classes taught by a priest as a regular part of the religion program.